S Tel, the GSM mobile service operator which has presence in Bihar-Jharkhand, Himachal Pradesh, Orissa, Assam and North East has introduced its pocket friendly 2.5 G EDGE/GPRS services over these circles. 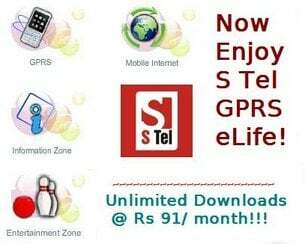 S Tel has introduced its GPRS pack under the brand name of ‘S Tel e-Life’ with 3 Unlimited data packs starting from Rs 4. S Tel prepaid subscriber can enjoy Internet on Mobile Phone at lowest default rate of 1paisa/ 20kb without these data packs. S Tel has a daily GPRS pack of Rs 4, which will offer Unlimited GPRS on your phone for 24 hours. Monthly Unlimited pack comes at just Rs 91 and if you want to shell out more grab a full year Unlimited GPRS pack at Rs 899. 1 Rs 4 24 Hrs. To get the settings for eLife on your GPRS enabled handset send SMS ELIFE to 57777 (Toll Free) or you can call the customer care at 1212 to know the settings manually. S Tel also rolled out its very own WAP portal – “S Tel Adda”. S Tel Adda” is a One Stop Shop to download your favorite ringtone, wallpaper, game, theme, song, video, mComics and many more. You can browse through the portal absolutely free only content download charge will apply. To get the S Tel Adda settings on your mobile phone one need to send a sms as ADDA to 57777 (toll free) and save the settings. Visit wap.stel.in to start browsing on S Tel Adda. It is better to be reminded that S Tel won 3G licences in Orissa, Bihar-Jharkhand and Himachal Pradesh. speed is varied by some reasons like tower distance and dns servers. when i got 3 signal bars i got maximum 66kbps. when i got 5 signal bars i got maximum 302kbps. change your dns server to google public dns server u got maximum speed.